Having a finished basement can be a wonderful asset to your home. With the addition of a pool table and a couple couches, these below ground hangouts are perfect for entertaining guests. With some dividing walls and light construction, you can turn basements into sectioned off living spaces. But what really puts the icing on the cake of a finished basement is having access to a bathroom. If you haven’t already, take a look at our article on small bathroom remodeling. There are some great style tips that will help you choose the best bathroom design for your space and budget. But before getting into the fun parts like remodeling and style options, there comes the matter of placing your bathroom. As with any new remodeling project, there are a number of factors to consider before starting. When it comes to basement bathrooms, placement is key. Consult the codes. With any remodel, it pays if you start by knowing your limitations. Talk to a structural expert about what you can and cannot do in terms of new bathroom installation. Follow the pipes. The next step is to choose an area that is close to your existing plumbing and electrical work. Belowground plumbing can be tricky, and picking a convenient spot will eliminate additional hassles. Easy access. Once you’ve determined the options available in your given area, you’re ready to focus on convenience. Think about placement options like a closet bathroom, or building beneath the staircase to conserve greater space for entertainment. Rental. Are you looking to provide a luxury bathroom as part of a finished rental space? You’ll want to use the area accordingly. Consider investing in a vanity sink and mirror, with a full tub or tiled shower. These will suit the aesthetic for a rental space and add greatly to your property value! Family. 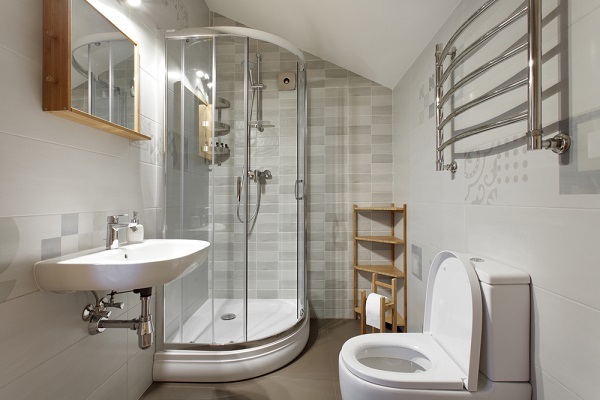 If having an extra bathroom for family use is your primary goal, consider keeping things small and simple. A traditional sink without a vanity will save space, as will a simple standup shower. Whatever you choose, having an additional bathroom is going to be convenient while also adding to the value of your home. Guest room. The third option combines plain functionality with a little something extra. Designing a mid-sized bathroom with a single sink and some light storage, as well as a tub/shower combo is a great in-between option for a frequently used downstairs living space. At Stohlman & Kilner, we have the expertise to transform your basement space with a functional, modern bathroom. No matter what the size or scope of the project, the result will be a professionally finished, stylish addition to your home. Reach out to our team for a quote today!